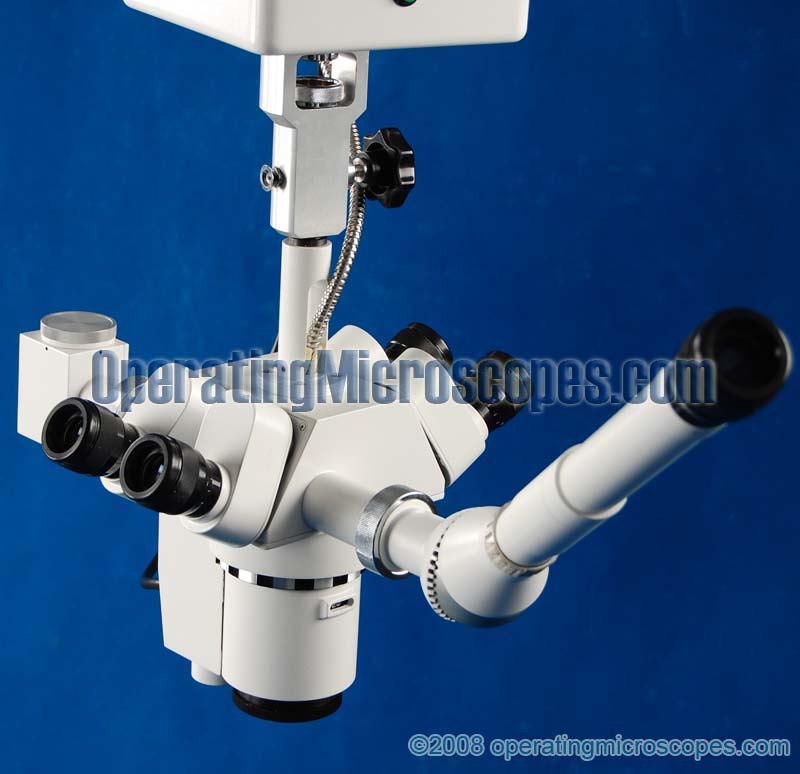 This model of operating microscope is primarily used for plastic surgery and orthopedic surgery, as well as hand surgery. 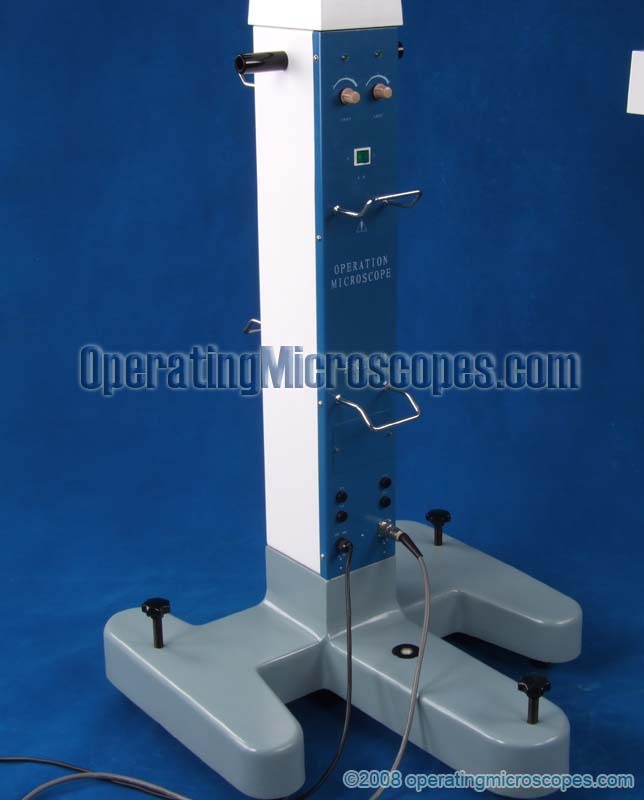 It is the needed optical tool for doing anastomosis of capillary and nerve connections in different kinds of microsurgeries. This process of anastomosis refers to the connection of two different tubular structures in the human body such as blood vessels, intestine, arteries, and veins. 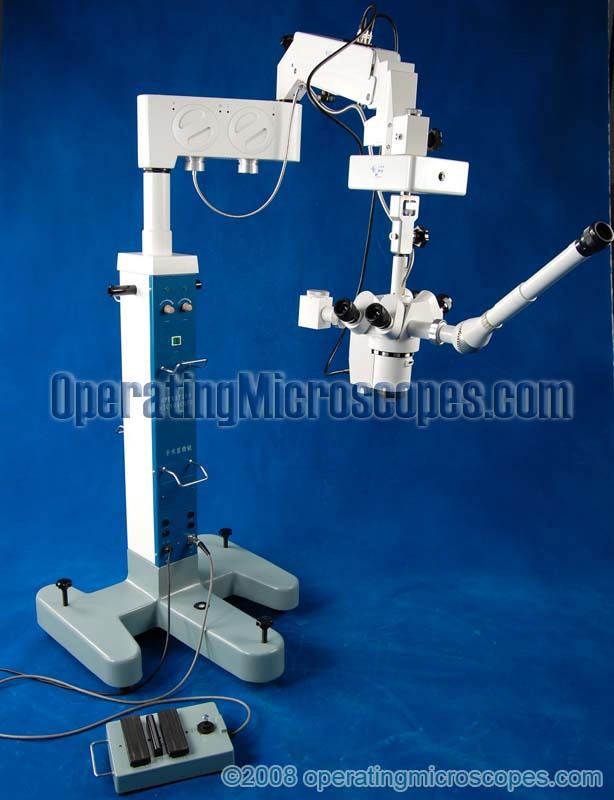 The main features of this surgical microscope are the motorization of the focusing, the zoom magnifications, and the centering of the optics over the working field of view. 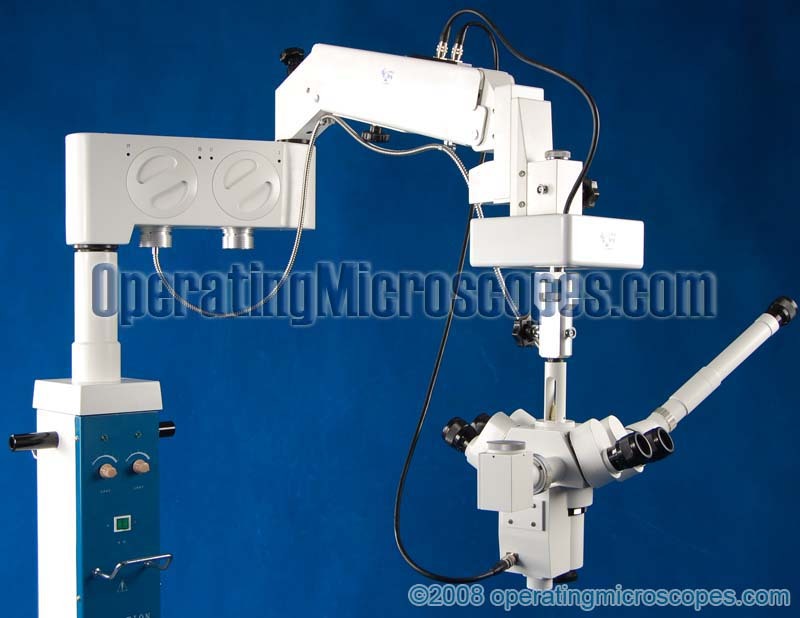 The motorized centering function locates the specimen in the viewing optics by moving the whole head assembly on an X - Y grid (40mm x 40mm maximum). This motor centers the specimen in the field of view. The controls are on the foot pad. 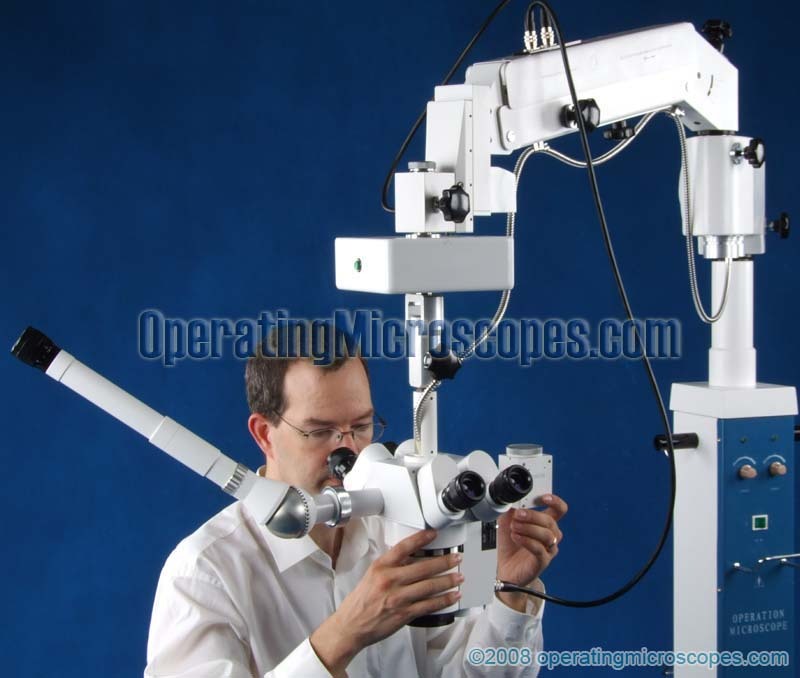 It also features two identical binocular heads for two surgeons to simultaneously view the operating procedure. One head would be considered the main surgeon’s head and the other would be the assistant (also called teaching) head. The dual binocular heads have a zoom magnification. 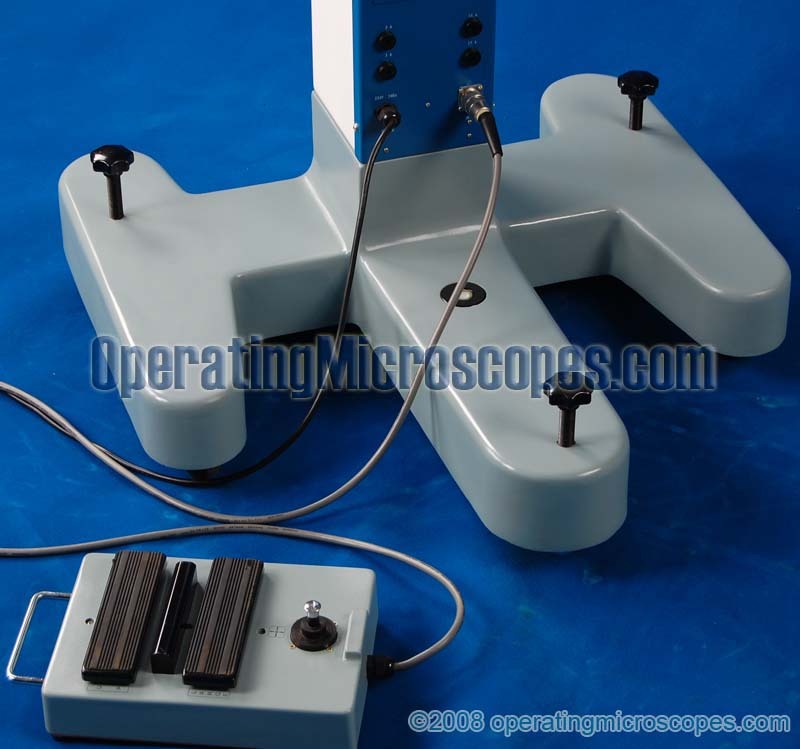 Sets of 12.5x eyepieces are used. 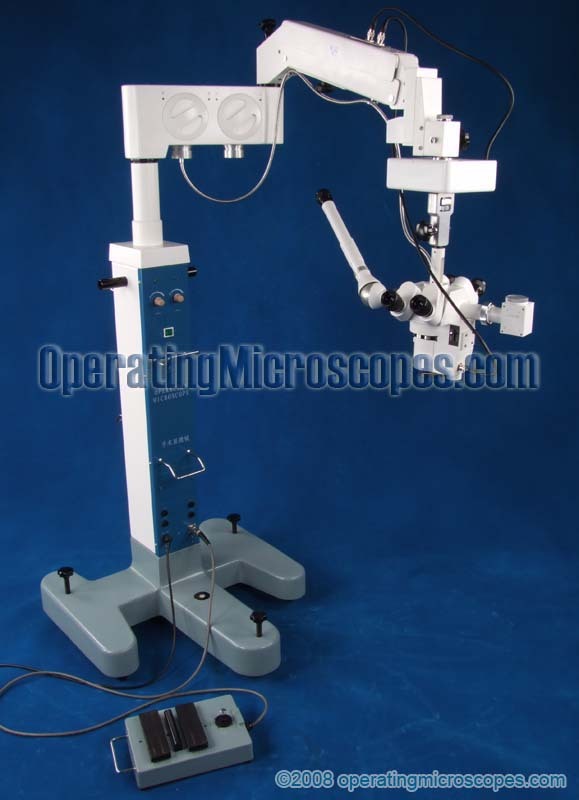 The microscope comes highly versatile with the inclusion of three different bottom objective lens: f200mm, f250mm, f300mm. This changes the focal length allowing different magnifications to be seen as well as different distances between the head and working specimen. Each objective lens will change the zoom magnification range. 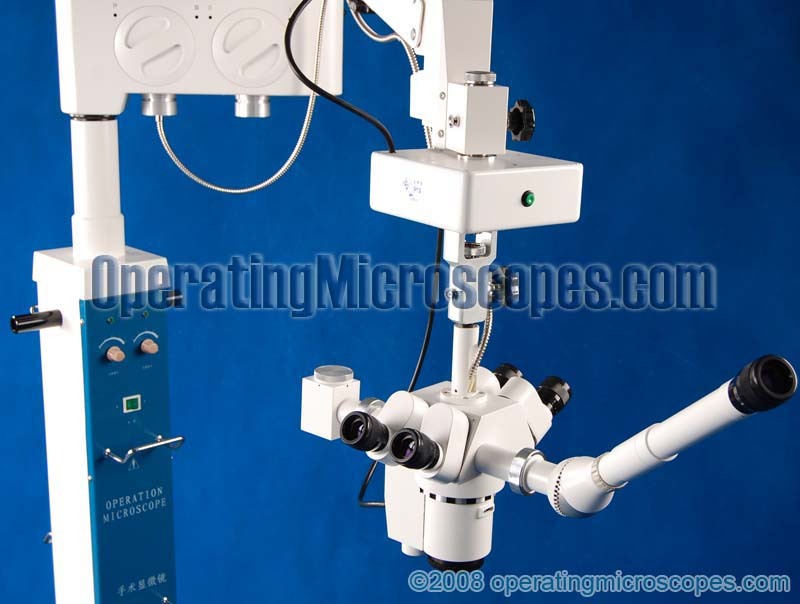 The surgical operation microscope comes with a monocular teaching tube that allows a second surgeon/assistant to view the surgery simultaneously. 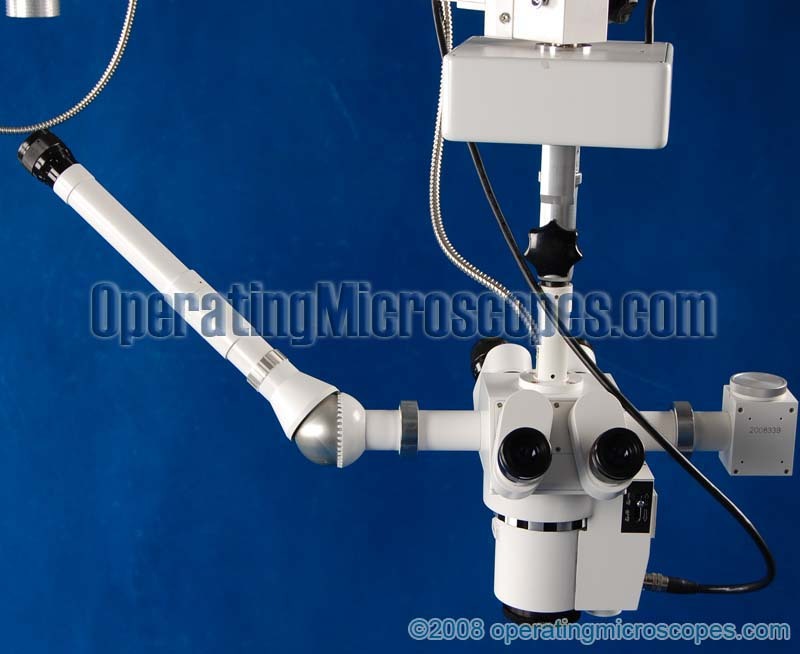 This model comes standard with a beam splitter built in to create a photography port on the side of the head. This allows the optional c-mount to be screwed to the beam splitter photography port. 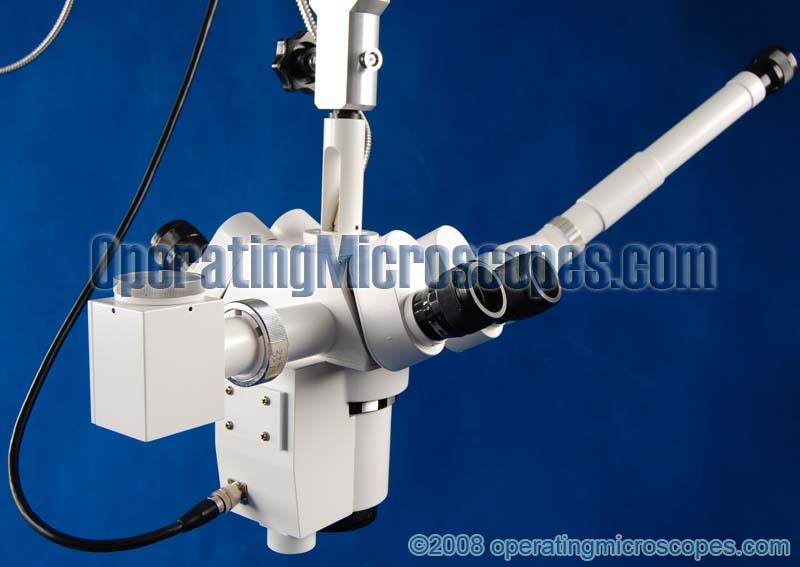 The optional c-mount is needed to connect an optional CCD camera for output of the image to an optional CCTV monitor for all the surgeons in the operating room to simultaneously view the operation procedure. 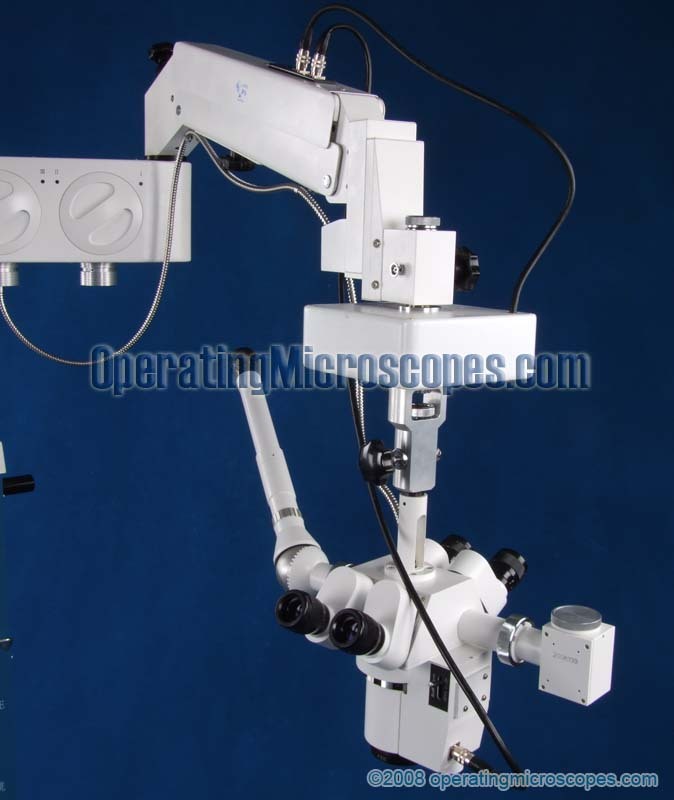 The operation may also be recorded on a video recorder using the optional CCD camera. 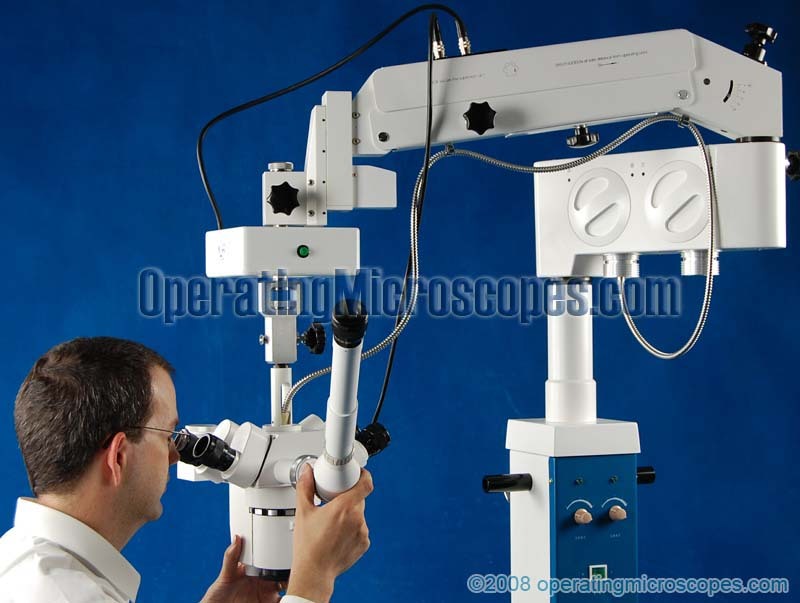 The c-mount, CCD camera, CCTV monitor, and video cable are all options, not included in the basic surgical operating microscope package.